← Winter Restarts At Last! The Southern Cairngorms have been consistently colder than the northern part of the massif this winter, so the cliffs of Lochnagar quickly came into good mixed climbing condition after the welcome snowfall late last week. 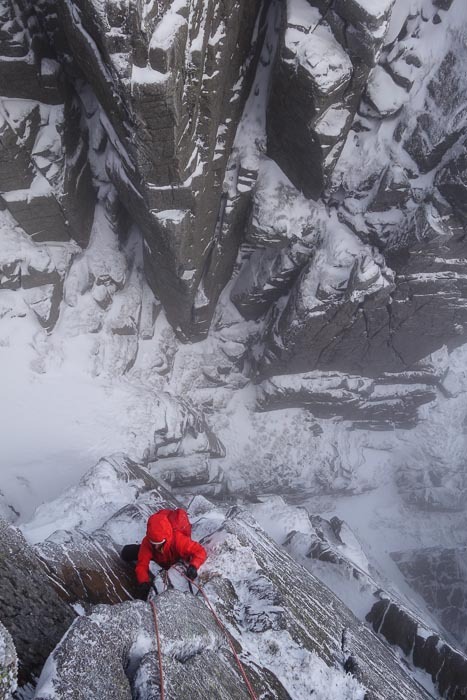 On January 18, James Richardson and Andy Munro visited the corrie to attempt Prince of Darkness, a three star VI,7 situated high on West Buttress. This was their third visit to attempt the route, but initially luck was not on their side. “Andy and I had our third (and final) visit to Prince of Darkness on Friday,” James told me. “Previous attempts have failed due to combinations of poor conditions and incompetence. You could argue these are linked!” Unfortunately, James and Andy were unable to climb the first pitch because it was unfrozen. “We were definitely in the right place'” James explained. “The wet bit on this attempt and the previous visit is on the first pitch – this time it was so minging we didn’t even get to the hard move! The moss was saturated and running with water and really deep. Last year’s visit it had been cold for ages so there is something funny going on. Perhaps there’s a spring, or it’s so sheltered in the gully that it takes a long time to freeze? We also managed to have a fantastic jammed rope abseil adventure on a previous visit, where there was rope friction on the flat edge of the plateau. On that occasion we ended up climbing one of the chimneys opposite to exit! Not only did James and Andy save the day with their ascent of Goldilocks, they also had time for an an early repeat of Quick Dash Crack (IV,5) on Sunset Buttress on their way back down. This entry was posted in New Routes and tagged Andy Munro, James Richardson, Lochnagar. Bookmark the permalink.